Two years. 731 days. 17,500 hours. Dale Earnhardt, Jr. stood despondent by his car Saturday night, watching in vain as another car, another driver pushed its way to Victory Lane. After weeks of coming oh-so-close, the newest member of the Hendrick Motorsports stable found himself four laps from returning to the very same spot in which he’d celebrated career win No. 17: Richmond International Raceway’s Victory Lane. The rubber stamp performance was within reach; the checkered flag that would quiet the critics, stop the clock, and throw the monkey off his back, all in one full swoop. 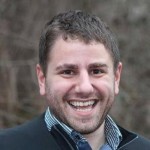 Instead, what many distraught Junior might call “a well-trained monkey” named Kyle Busch – who also doubles as the hottest driver in NASCAR these days – collided with Junior’s No. 88 rear quarterpanel going into turn three. The physical force was all too real, the results merciless for the driver to control; three seconds later, Junior’s car was in the wall, Busch’s car was leaving the crime scene, and Clint Bowyer was busy taking the trophy from them both. As the dust settled and the race finished, you’d expect the frustration from a man who just lost to boil over. Heck, even Mr. Rogers would have thrown a couple of ill-timed swear words in the midst of performing a chokehold around Kyle Busch’s neck. But in the midst of it all, Junior’s anger was drowned out amidst the continuation of his record drought. No amount of emotional outburst was going to keep that zero in the win column from changing any more than it would have caused rain to come down in northern Georgia. Tick, tock. Tick, tock. Try as he might, the clock won’t stop. And like that, the good guy was reduced to pile of mush, Superman weakened by his kryptonite that came in the form of the man he replaced. Kyle Busch has made no secret of the fact he wants to prove former boss Rick Hendrick wrong for letting him go, and it’ll take fans months to even try and let go of the possible conspiracy theories that result from a wreck like this one. Of course, Busch was quick to throw water on the fire of any such nonsense. What Busch didn’t mention is how steep the price may be. Ten of Junior’s 17 career wins have come at three tracks: Phoenix, Talladega, and Richmond. This was the final leg of a triumverate in which the fast-starting No. 88 expected to get at least one win, making Junior’s streak a non-issue heading into the middle of the summer. Phoenix was close, but no cigar; an empty fuel tank proved a partial culprit in handing the win to teammate Jimmie Johnson. At Talladega, it was a case of wrong place, wrong time; leading 46 laps, Junior was helpless when perennial drafting partner Tony Stewart lost it in front of him. You be the judge. But the verdict is in; no matter who or what is at fault, Junior’s win column will continue to stay marked at zero. Moving forward, that’s going to be problematic. Of the next seven tracks on the schedule, Junior has a points-paying Cup victory in just one (Dover), while having a history of being wildly inconsistent in several others. That doesn’t mean it’s impossible for the No. 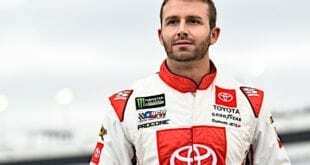 88 to get shut out of the Winners’ Circle; the team has run consistent enough, as Junior’s 15th place finish Saturday night was his worst since California in February. Now third in the points, the No. 88 team stands just 104 out of the top spot, far above where most prognosticators placed them at this point in the year. But Junior knows this year isn’t about putting points on the table. 20 top 10 finishes won’t obscure the two criteria in which the most important season of his career will be judged by the non-biased public: the number in the win column, and how this season compares to a certain little 23-year-old tearing up the circuit in the No. 18. Right now, Junior’s got that dreaded “needs improvement” on the report card on both counts. 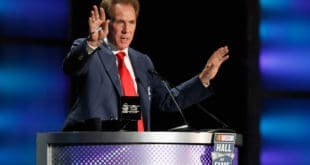 Despite leading laps in eight of ten races this season – more than anyone except Denny Hamlin, whose total is helped exponentially by the 381 in which he paced the field Saturday night – Junior hasn’t been able to put it all together in each race’s final segment. 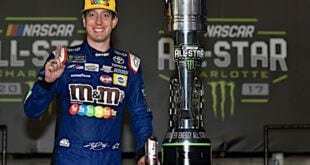 In the meantime, the man he replaced has been lighting up the circuit; Kyle Busch has won seven races this season within three different series, all while taking the lead in points with his Joe Gibbs Racing Toyota. If the Chase started today, both drivers would make it but Busch gets the upper hand; with 20 bonus points for his wins, the 23-year-old is running circles around the team who fired him in every which way he can. Now? Busch will be circled with death threats and countless harassment by “Junior Nation” for months to come; “win to spin” is not a traumatic event one gets over anytime soon, especially when 72-race streaks are involved. But for now, they haven’t come. And Kyle Busch has won. Apparently, we’re at that point in the comic book movie where the good guy reaches some sort of crisis; the villain is wreaking havoc on the world he’s left behind, and our hero has to figure out what to do to find himself and reload for the upcoming climax. Hopefully, Dale Jr. has a few more bullets left in the arsenal. Because he just used up three good ones over the matter of a month…and there’s no going back.